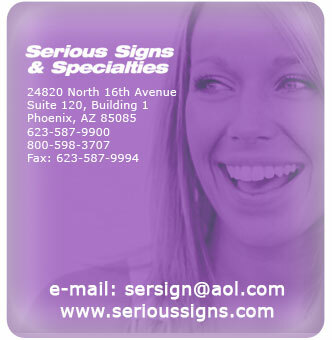 Established in 1989, Serious Signs & Specialties has always been dedicated to customer service and satisfaction. Our extensive experience combined with up-to-date computer technology allows us to offer you the products best suited for your individual application. We're here to help you promote all aspects of your business by providing you with a variety of services at affordable prices.